OK, now Christmas season must be here. 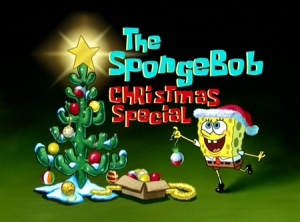 My daughter and I just finished watching the Spongebob Christmas Special for about the 50th time since it first came out in 2000. Bikini Bottom learns about Christmas for the very first time (from Sandy) and Spongebob decides to bring Santa Claus by getting everyone in town to write letters; something Squidward refuses to do. But, to Spongebob’s dismay, Santa doesn’t show up and Squidward finds himself trying to save the day. It is a great story of the holiday spirit. The special comes with a somewhat annoying, but very funny song about the Very First Christmas. has seen this movie quite a few times was laughing her tail off at that song. In fact, after seeing it (On one of our On Demand Channels) she wanted to watch it again. Christmas show that is somewhat different but still offers the same Christmas beliefs other shows offer, this is an episode I would recommend watching. In fact, you might want to make sure you tape it so you can see it several times. Spongebob Squarepants Season One: F.U.N. Spongebob Squarepants Season One - F.U.N.